Here in Japan I drive a Honda Logo, a supermini that was kind of a precursor to the Fit you’re familiar with. Honda, unfortunately, never made a Logo Type-R, but I’m getting close with a few simple and affordable interior swaps. I used factory parts, just never in way the factory imagined. As I’ve spoken about more than once, it was impossible for me not to look at my car and think some kind of super-deformed sixth generation Civic. I love the shared design language of Hondas from roughly 1995-2001, depending on the specific model, which my car definitely has. So, I decided given that it was a $975 combination daily driver and project car I wanted something both interesting or unique and comfortable. For that reason I decided to pursue the idea of a “what if?” What if Honda had gone further than just the TS and actually made a Logo Type R? For some this is a ridiculous idea worthy of scorn. For me, it seems like just the kind of ridiculous idea that I so often see in Japan, especially from students at the automotive colleges. It’s a great way to learn. It’s true that I eventually want to do an engine swap to a B-series or K-series motor and a transmission swap to a manual (the TS models, the highest models of the Logo, did not come in manual, and I don’t have a manual license, yet. I could drive manual in the U.S., but it has been quite a while since then). So, I’ve mostly been focusing on fixing the exterior problems and changing the interior to what I want. When done, I’ll work with my mechanic or a dedicated shop to arrange how we’ll do the swap. To that end, I have been collecting parts. This weekend, I received a new passenger door (to replace the dented one), a seventh generation Civic Type-R carpet, and a 2001 Logo TS facelift cluster. The door cost me $189, the cluster $90, and the carpet $120, with shipping. All significantly cheaper than if I had purchased them from Honda or to be honest, tried to purchase similar Civic parts in the U.S. Unfortunately, I did not have time nor the help to install the door, but I was able to put in the carpet and the cluster. I chose the seventh generation Civic Type-R carpet over the sixth generation CTR carpet because after looking at the dimensions and hole spacing, I believed that the seventh generation carpet would be a much closer fit. When I received it, it looked pretty dirty, but a closer inspection revealed the vast majority of the dirt was on the surface. Vacuuming once before a dab and scrub with Spray & Wash and then once again after delivered a fairly close to mint carpet. The 2001 Logo TS cluster was, of course, a direct bolt in replacement for the 2000 and earlier TS cluster. In addition to looking significantly sportier (it is possible to get the revs up to red line when using the CVT in sport mode), the lighting, numbers, and indicators are much more of an in-your-face red. Important when the interior theme is very heavily red. The old dark gray carpet (which needed to be replaced regardless, it had holes in it, was in terrible condition, and very dirty) had already been pulled out, so as soon as I pulled the car into the temporary spots we can use for about a day or so at my Tokyo apartment, I pulled out my tools and got to work. I also pulled out my fourth generation Integra Type R Recaro seats and set some Spray & Wash over various stains or marks, as this was a perfect opportunity to do so. As expected the purchased carpet went in relatively easy. The general floor shape was almost perfect, the molding fit, and the holes lined up. The only major issue is that there are significantly fewer plastic sidewall/molding parts in the Logo. Where the Logo carpet curved up to create sidewalls to match the door lining and B-pillar interior panels, the seventh generation Civic carpet is just mostly flat. My solution is to create a sidewall from something like gutter guard/garden edging to fit under the door lining, B-pillar, interior panels, and sides of the foot wells. 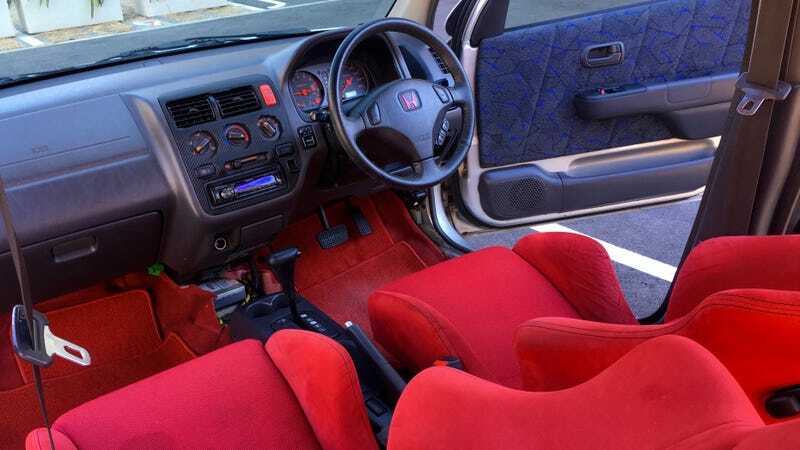 I also want to later mess around a bit with the carpet edge under the center console. There should be more than enough to have it sit flush, but I think I may need to lay down adhesive/velcro to the two sides to keep a bit of it from sliding out. But overall? Very good. I had believed the replacement of the cluster would be easier. I had switched out the cluster in my sixth generation Civic, and it only took one screw and a little hand power. Everything about the Logo looked the same. Patrick George, our illustrious Editor-in-Chief, warned me that I was asking for trouble, but fool that I am, I dismissed his warnings. Instead, I had to disassemble the entire steering rack cover, and in doing so, slipped, broke most of the clips, and cut a deep wedge of skin out of my thumb. YOWCH. Once the cluster was out, though, it was easy enough to put the 2001 version in. As expected, it was a perfect fit. I turned it on to see if it worked, and it did. One problem I need to figure out how to solve (as you may have noticed between the picture of the old cluster and the picture of the new one) is that the kilometers on the odometer are stored in the cluster itself, and not the ECU, so the odometer numbers do not match. I’ve been told that there are a few options for correcting it, but some require soldering beyond my ability or the purchase of a diagnostic kit. I am wondering if any readers know if it’s possible for Honda to correct the kilometers at the dealership. However, I am keeping detailed records of the difference between the clusters and am not planning the ever sell the vehicle, so there seems to be no legal issue with the cluster swap. Still, I’m quite pleased with how the result has so far turned out. However, there is still much to do. The aforementioned side walls being perhaps the most noticeable of these issues in keeping the modification from looking “clean,” a few more accents or tidying up mistakes I or the previous owners have made, and then getting around to actual performance. Not too bad for trying to create a car that never existed!